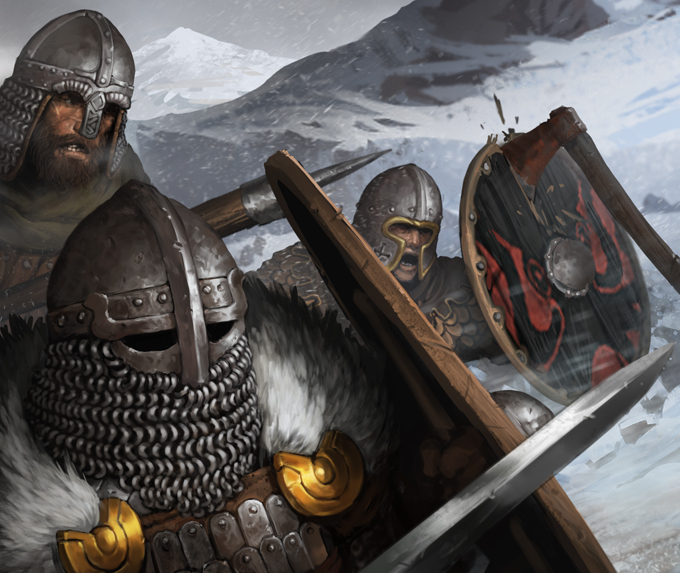 The upcoming ‘Warriors of the North’ DLC will not just bring more replayability and nordic equipment, but also introduce an entirely new human faction to the game. They’ll come with their own lore, armor and weapons, enemy types and fighting styles to pose a unique challenge to any mercenary commander. Let’s delve in! During the development of the ‘Beasts & Explorations’ DLC we had this idea for groups of wildmen roaming the northern parts of the map. Essentially, they’d be a different flavor of brigands and use existing assets. Except, maybe we could also squeeze in one new armor if we found the time? Or maybe even two? 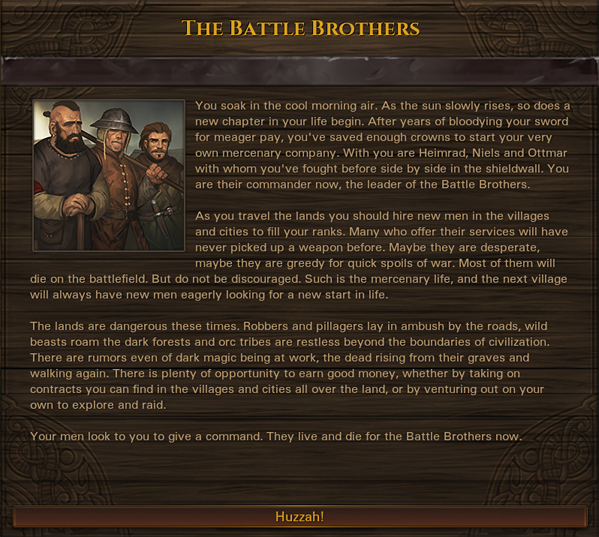 And so we decided that if we wanted to do them, we’d do them right and dedicate the time necessary to give them equipment and mechanics of their own, their own music, as well as contracts and events to convey their lore and the part they play in the world of Battle Brothers. 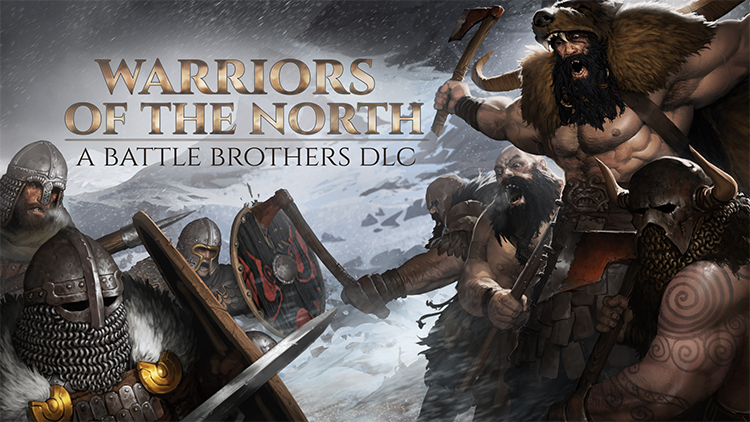 So here we are, with a ‘Warriors of the North’ DLC in development. Many hundred years ago, in a different era, an empire of man spanned much of the known world. An empire, not of petty noble houses, but one of a dozen provinces, from the blistering sands of the south to the frozen tundra of the north, of a dozen peoples under one banner. As the empire spread further and further to the north, it became entangled in constant war with countless tribes of barbarians. Some were subjugated by force, some saw opportunity and swore allegiance, others faded into nothingness, but many more remained free; their constant raids and incursions a thorn in the side of the empire. The empire, as you may know, eventually crumbled under its own weight, and feudal houses emerged from the dust to rule the lands in its stead. Yet, in the very north, the free barbarian tribes remained free still. For them, their own tribe is the beginning and the end, it is bliss in life and death, for their family is holy to them and they believe to sit with their ancestors if they meet their end in this life. They roam the harsh and infertile lands as they have been for hundreds of years, they raid to claim what they need, and they sacrifice their prisoners in bloody rituals to prove their worth to ancestors who ascended to be gods through their deeds in life. But they’re not beasts, and they’re not of alien minds like the greenskins. They’re humans; and while they speak a different tongue, they can be reasoned with, and they know the concepts of honor, and friendship, and truce and bartering. What they do, they have to do in order to survive in the unforgiving lands they inhabit. They follow their old ways to this day. They’re the warriors of the north. The warriors of the north are ferocious fighters, but with scarce resources and a nomadic lifestyle, they usually don’t have access to the level of equipment that other human factions do. Many of them wear armor crafted from pelts and furs, and while some do boast metal armor, not least because it is a matter of prestige, the harsh climate of the north often has taken a toll on it over the years. Some barbarians even forego armor altogether, and instead paint their bodies with magic runes to call upon their ancestors to protect them from harm. Their weapons are likewise often crafted from wood and bone, some of the few materials readily available to them, or have been handed down through generations and show signs of wear. Generally, all barbarian weapons have somewhat lower base damage values, but a higher percentage of damage that ignores armor than comparable weapons in the game. Of course, all their armor and weapons are lootable and equippable by you, too – and there’ll be named variants as well! In combat, a barbarian warband doesn’t bother with formations, and they have no backline with polearms or dedicated archers. They are a horde of ferocious warriors in a constant shuffle of everyone trying to bring their weapons to bear against the enemy. They’ll shower you with throwing weapons, they run towards your line, and they make ample use of the ‘Adrenaline’ perk to overwhelm you before you can even strike back. They don’t fear death the same as other humans do, so they are not easy to break, and getting hurt will only further incite their barbarian wrath. 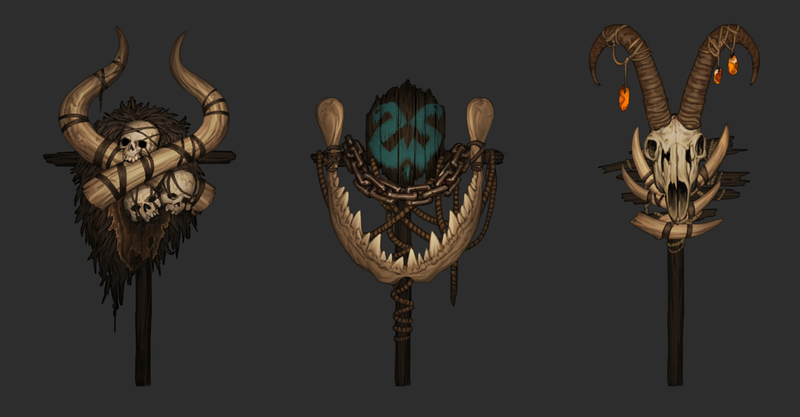 Because a barbarian warband is but a loose collection of individuals, unified only in their tribal bonds and their willingness to fight for their place in both life and afterlife, their unit types are quite diverse in terms of equipment and perks, as you’ll see in a future dev blog. It’s Friday again! 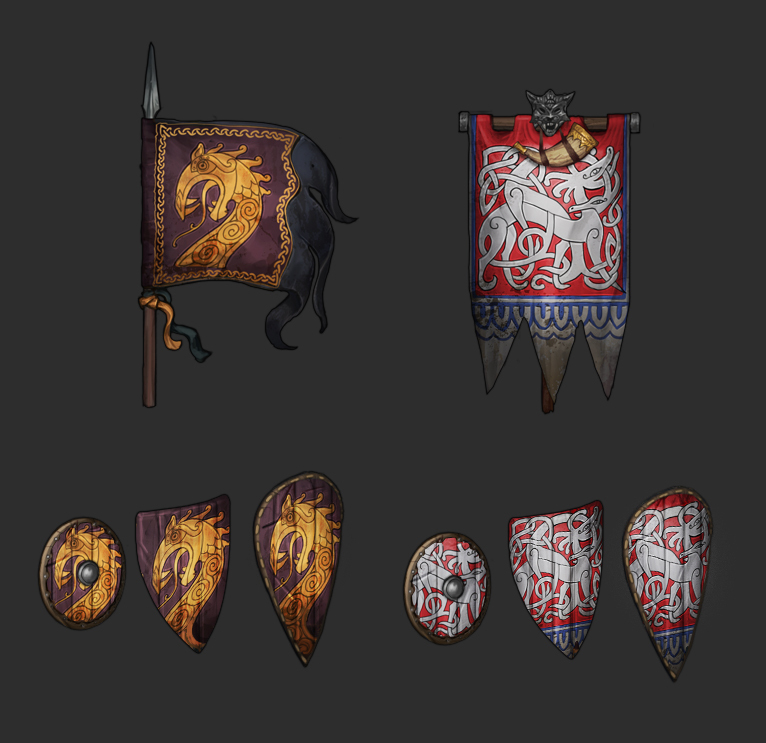 This week we’ll take a look at some of the new nordic and rus inspired equipment and player banners coming with the ‘Warriors of the North’ DLC. Just keep in mind that things are still in active development, so we can’t show everything that is to come just yet, and things may still change. Onwards! Coming with the ‘Warriors of the North’ DLC are two new player banners. One is more inspired by scandinavian vikings, the other by rus vikings. 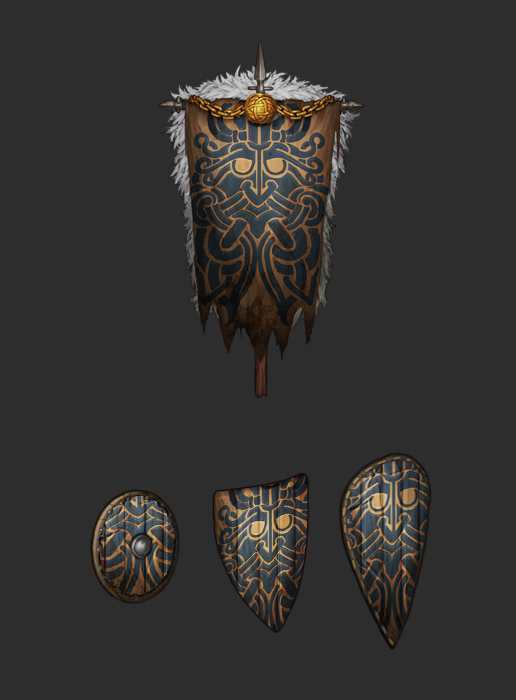 Of course you’ll be able to paint your shields with the motif of these new banners as well. Many of you supported us beyond the asking price of the ‘Beasts & Exploration’ DLC by getting the Supporter Edition. 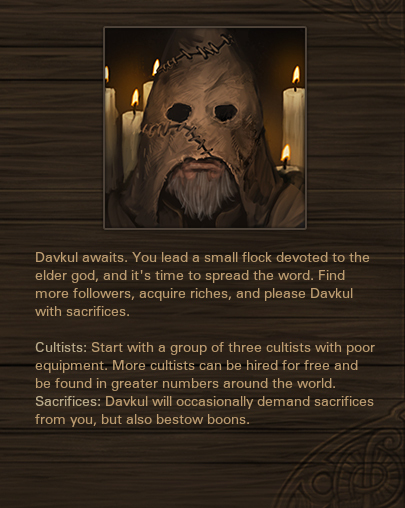 We’re very thankful, and your support has shown how much you appreciate us creating more content for Battle Brothers. We’ll also be offering a Supporter Edition for the new DLC as well. There’ll be more details at a later time, but for now, here’s a preview of the bonus banner and painted shields that’ll be included. The harsh climate of the northern tundra and hills is home to a hardier breed of wardog, the warhound. Bigger and stronger than its southern brethren, it can bring a grown man down on its own, and take more of a beating, but it is also slower and therefore less suited for chasing down runners. You’ll face the warhound in battle, and you’ll also be able to purchase your own at northern settlements. If your mercenary company operates in the north, and perhaps if it even hails from the north by virtue of choosing the ‘Northern Raiders’ company origin, you may want your men to look the part. 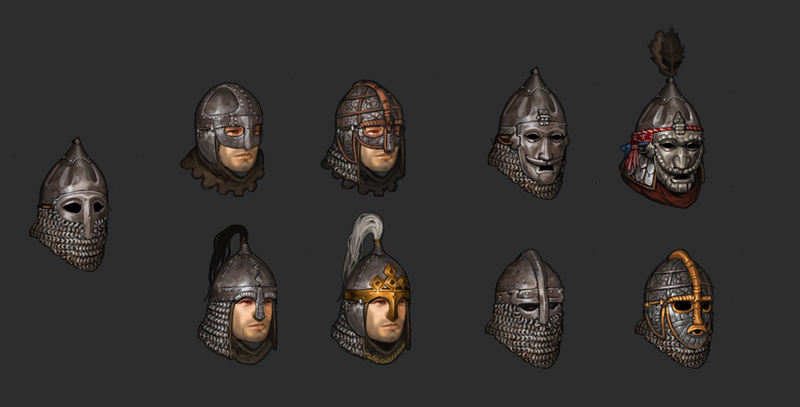 The DLC will introduce various new helmets inspired by historical nordic and rus designs. Most of them will also come in extra fancy named variants to hunt for. 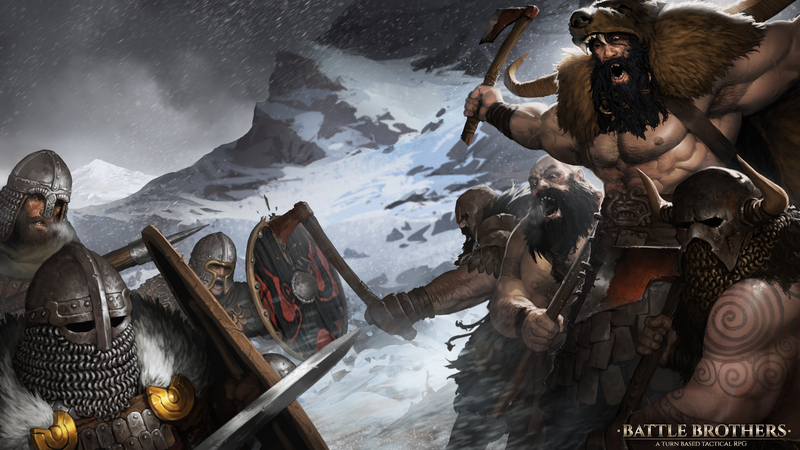 Last week we talked about what the company origins feature of the upcoming ‘Warriors of the North’ DLC is exactly and looked at several of these origins. This week we continue with a closer look at two more origins that are part of a larger selection for you to choose from. Just keep in mind again that things are in active development and may still change – let’s go! With an expansion focused on bringing variety and flavor to the northern parts of the map, it’s only fitting that there’d be an origin that has you start in the north as well. Playing as northern raiders let’s you start with veteran raiders that are well-equipped with some of the new nordic and rus inspired armor and helmets which we’ll show in an upcoming blog post of its own. However, you’ll also start as outlaws, which means that 2 out of 3 noble houses are outright hostile, while the remaining one is distrustful. It makes for a challenging start where you rely more on venturing out on your own instead of taking on contracts. 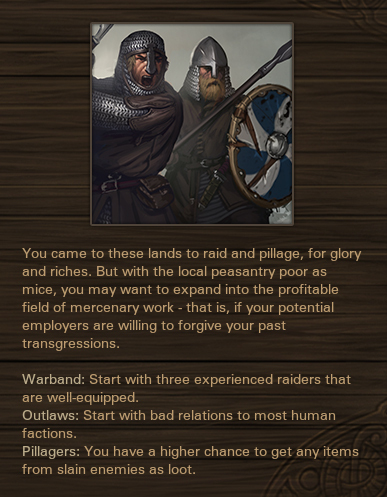 And it’s up to you how to proceed: Do you want to mend relations over time and become a proper mercenary company, getting paid by the the noble houses, or do you continue with raiding and pillaging, alienating the nobles further? 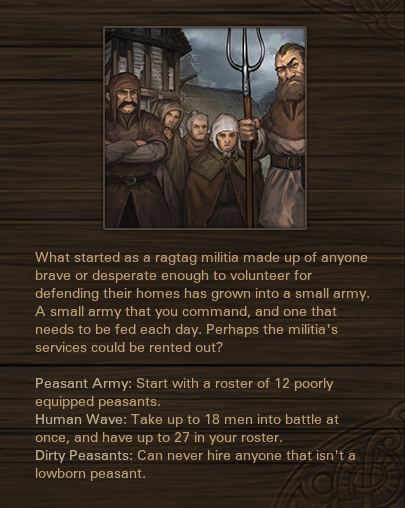 Fortunately, your men are quite proficient at pillaging, and you’ll have a higher chance to get any equipment dropped by your enemies in battle, so you’ll have to rely less on being able to buy equipment in cities that will most likely just send their militia after you. For a very different experience of playing the game, and in some way the opposite to last week’s militia origin, have your player character be present on the field of battle. 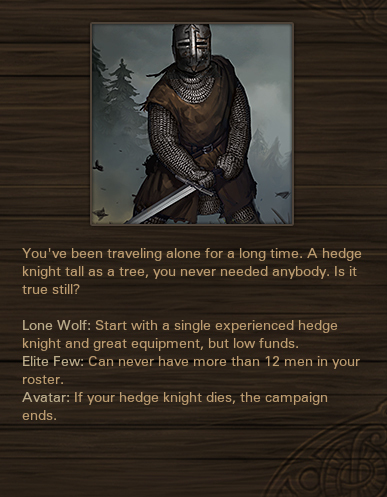 You’ll start with a single well-equipped and experienced hedge knight who is, in a way, your player character. He can’t be fired and he’ll never desert the company, but if he dies, your campaign ends and you lose the game. He’ll be the strongest man in the company for quite a while, but having him in the fray is always a risk, so you’ll have to think carefully on how you want to use him. And because this origin only ever allows you to have 12 men in your roster, there’s no putting him in the backline – you go out there and fight side by side with the rest of your men, or you’ll leave them at a disadvantage and have them call you a coward. Having to defend your player character adds a different layer of strategy to each battle. Despite your character starting out strong, it’s a challenge suited best for experienced players. There’s more origins to choose from still, but we don’t want to spoil everything, so you’ll have to find out for yourself by playing the game. Join us again next week when we take a look at a different feature of the upcoming DLC!